Is marketing evil? It’s a question that new authors struggle with every day in the self-publishing landscape. After all, you don’t want to be a used-car salesman; you want to be an artist. By learning how to get readers to buy your work, wouldn’t you sully your reputation as a creative professional? The answer may surprise you. Writers like Joanna Penn have adopted the term authorpreneur to describe creative book crafters who consider the business side of their publishing career and their art in equal measure. The secret to the most successful author entrepreneurs is simple. They believe their marketing is just as creative as the words they put on the page. Marketing gets a bum rap as the profession of scam artists who will perform any dastardly deed imaginable to make a sale. There certainly are examples of people who have earned this negative reputation, but you have an advantage over these fraudsters. While anybody can learn the basics of selling and consumer behavior, you’ve spent your lifetime developing your creativity. By applying your outside the box thinking to the marketing side of your publishing business, you’ll be able to come up with new and unusual ways to get your product in front of more readers. All you need to do to apply this creative commercialization is change your mindset that marketing is bad. While most people have heard the phrase, “Don’t judge a book by its cover,” hundreds of times over, it won’t stop the average person from buying a sub-par book. The artful cover, movie trailer, or television promo will get people to check out a work of fiction or a new blockbuster. While fancy marketing will bump up the sales of a poor product, it’s a short-term strategy at best. Look at film director M. Night Shyamalan. His big hit “The Sixth Sense” had the killer hook of Haley Joel Osment’s character saying, “I see dead people.” The movie brought fans out in droves through its marketing campaign and the genuinely thrilling product behind it. Shyamalan’s next few movies, “Unbreakable,” “Signs,” and “The Village,” each followed the same formula: a killer hook and a massive plot twist at the end. While the marketing effort for each picture used the hook and Shyamalan’s name to pack the theaters, each successive movie dropped in quality. Future films had similarly strong hooks, but audiences had grown wise to these substance-free motion pictures. Box office dropped for these films because the quality of the marketing no longer matched the strength of the movies. One of the reasons that creative professionals give the idea of marketing the stink eye is that they equate it with spammy email messages and Facebook posts. There are marketers who engage in these practices, but these methods are far less successful than the creative ideas you can come up with on your own. Once you learn more about the most effective ways to market books, you can give these tactics your own spin. The first person who tries a promotional idea is usually the one who gets the most benefit out of it. Some authors send out a weekly email to keep up with their fans. The Self Publishing Podcast trio put their own creative spin on the weekly email by giving readers an email-only serialized story. You might take this even further by producing a serial for a podcast or a YouTube channel. When you add your own flavor to an idea that’s been done before, it becomes brand new and gives you the best chance of success. Adapting these ideas not only improves your likelihood of selling more books, but it also makes you a promotional pioneer with a new way of reaching potential fans. Marketing is all about finding ways to sell more books within your available time, money, and energy reserves. If you promote yourself effectively, then you’ll sell more books, which will theoretically give you more time, money, and energy to write more in the future. By putting more creativity into your marketing, and boosting your sales and income, you’ll be able to spend your creative energy writing more books. As you improve your promotional prowess, the cycle will continue to build how much of yourself you can give to your work. The bestselling self-publishing authors produce a lot of content on a weekly basis. This massive output requires constant creative inspiration. By giving your creativity a workout on the marketing side of things, you may come up with new ideas that give your writing a boost as well. Take the serial idea for instance. Creating a sideways story that connects with your main universe is a known marketing method to bring in more readers. As you serialize this story over a podcast or YouTube, you start to think more deeply about the origin of one of your supporting characters. Your introspection about that character could lead to a breakthrough that informs your main story. If you hadn’t made the effort to market your book in a creative way, then that inspiration may not have come to you for your main story. Building creativity into your marketing may help you to come up with new ideas on both sides of your artistic business. Creativity is essentially the brain’s ability to come up with something out of nothing. When you have a thought that wasn’t there before, you’re engaging in creativity on a small scale. Putting your book out there in unique ways allows your readers to creatively think of your book as something they’d like to read. As you build up your fan-base, your most voracious readers will develop new and unusual ways to promote your book for you. It’s not unheard of to see superfans dress up in homemade costumes of characters or paint art of their favorite protagonists. The creative output of readers and fans would never have happened if it wasn’t for the creative marketing that went into these products in the first place. This creativity may even inspire fans to develop their own books, shows, and movies going forward. Artists who say they’re above promotion come off like they’re high and mighty. Salesmen who are obviously in it for the money seem like major jerks. As a creative businessperson, you can find the middle ground as an artist who sells your work to the masses. By applying your unique perspective to the work and promotion that you produce, you’ll increase your chances of being successful on two fronts. 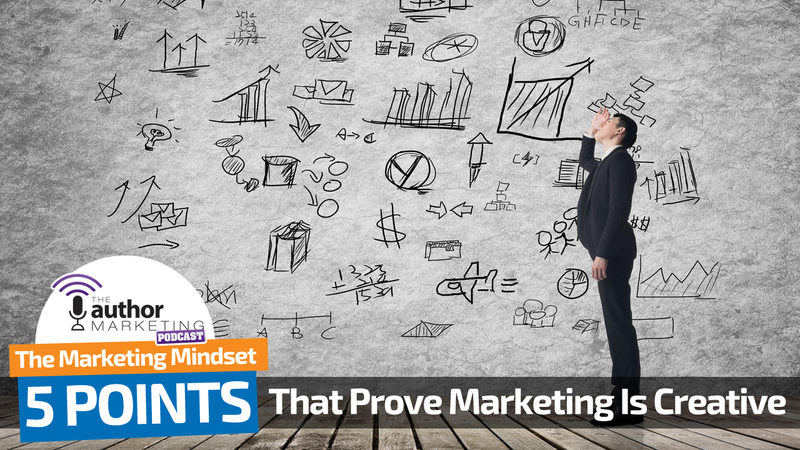 You’ll prove that marketing isn’t evil. It’s a series of artistic means that let you spread the word about the work you love.